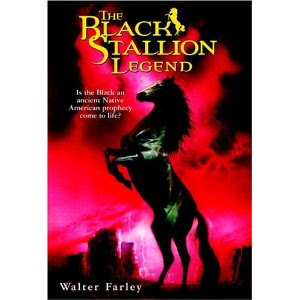 Taking only the black stallion, Alec Ramsey heads West to escape from personal troubles and discovers, living among the desolate northern Arizona mountains, a tribe of native Americans awaiting the end of the world. This last in the famous series about a young boy and his beloved racehorse is deeper and much more “adult-like” in nature than the books that preceeded it. It shows Alex (the young boy from the begining of the series) as an adult faced with trememdous issues and obstacles. I remember when I first read this book as a teenager I cried at the beginning and I cried again at the end, but for totally different and contrasting reasons. Even though I loved the beginning books, which are much more innocent and happy in their nature, I ended up loving this one the best because not only did it bring about a heart warming conclusion to a classic series, but the writing, in and of its own in this particular book, is expert. This entry was posted on Tuesday, July 27th, 2010 at 5:56 am	and is filed under Uncategorized. You can follow any responses to this entry through the RSS 2.0 feed. You can leave a response, or trackback from your own site.